The trek from Kharta to Khangsung, the eastern face of Mt. 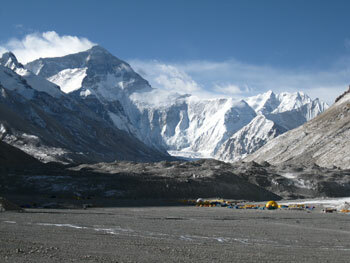 Everest, is one of the most gorgeous in the world. It takes 6 days for a round trip. The entire region from Kharta to the Kama Valley. extending to Arun valley in Nepal, is part of bless land of Guru Rinpoche known as "Belyul Khebalung" or the hidden valley. The region has holy lakes, mountain and the sacred "Kharta Thechu" the long-life water spring. Day 16 : Trek from Langmalato Khata Valley Over Night Camp.